The HUR devices and solutions are designed to use strength training as a therapeutic modality in prevention, treatment and rehabilitation of several health concerns and diseases by using the HUR’s Natural Transmission method. It is based on pneumatic technology, where resistance is adapted in accordance with the production of force, regardless of the speed of the movement. Intelligent technology system for automated reporting, zero starting load and 100g/1kg increments in resistance, range limiters and additional support with connected outcome measures to document the effectiveness, enables to start strength training safely when considering the individual treatment prescriptions e.g. appropriate medication. The equipment in the HUR Premium Line is accredited as medical products, and registered by The National Supervisory Authority for Welfare and Health. The HUR solutions helps the health care and rehabilitation professionals to provide the best practice of exercise as medicine based on the latest international treatment guidelines to promote customers and patients with increased level to regular weekly habitual physical activities and exercise training regimen. Verve is a nationwide provider of occupational welfare services in Finland. Verve sees occupational wellbeing and rehabilitation as an integral part of work and workplaces. Their wide range of services helps individual customers and working communities to develop in their work and to improve their wellbeing during periods of change. Rehabilitation often also gives customers a helpful push towards looking after their general fitness and psychological wellbeing. Verve Oulu, located in the middle of city center of Oulu Finland, has been worked together with HUR and University of Oulu, Finland almost 20 years developing together rehabilitation concepts and solutions for example related to coronary artery disease and type 2 diabetes rehabilitation. The results of these projects have been published in high international scientific level and implemented to the clinical rehabilitation practice especially in Verve, but also in national and international level of rehabilitation centers and units. Medirex has the start in 1983 been a Finnish forerunner within rehabilitation. The staff of 27 professionals is specialised in different areas of rehabilitation - in both traditional and modern practices. Safe, versatile, university level developed equipment - together with the independent training and automated reporting made possible by the computerized systems HUR SmartTouch – HUR offers the top-notch solution for different types of rehabilitation. The equipment for rehabilitation in the HUR Premium Line is accredited as medical products, and registered by The National Supervisory Authority for Welfare and Health. The importance of testing and measurability can of course not be stressed enough when it comes to rehabilitation. HUR delivers high-quality testing machines and functional packages, where tests are incorporated into machines that are in daily use. In this example we see our multi-functional HUR Pulley machine, iBalance platform, Monark bicycle ergometer and HUR Leg Extension/Curl machine with isometric test capabilities. With the HUR SmartTouch system, we have combined several functions for computerized human performance testing, training and documentation, using state of the art training machines. HUR equipment is designed in accordance with current requirements for accessibility. The machines are designed to efficiently use space while offering impediment-free accessibility. Our unique HUR Easy Access machines embody top-design and expand user options far more than more traditional solutions. Clients at rehabilitation facilities will appreciate a quality and professional service and a gym equipped with safe and professional-grade machines. Following rehabilitation, many clients wish to continue training in a familiar and safe environment, where if needed help and individual guidance are readily available. HUR PhysioFitness is a model that in all equipment and spatial solutions takes into account not only normal rehabilitation functions but also allows for a broader use of the training locale. After rehabilitation, clients become loyal clients, which results in more satisfied clients and economic viability. With our computerized HUR SmartTouch machines, all additional services can be professionally and cost-effectively implemented with minor use of staff resources. 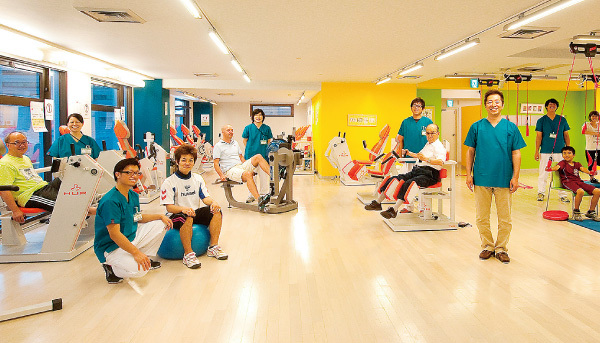 The advanced design of HUR machines allows a functional and versatile gym to fit into a smaller space. HUR machines are effective but small in size and can be placed adjacently to walls. Many of our machines are dual-function: for example, our knee extension-flexion or hip abduction-adduction machines. The Reaktiva rehabilitation facility in Zagreb, Croatia focuses on the continuation of rehabilitation for adults. This is mostly on the development of psycho sensory motor function after spinal column lesion. The clinic offers an environment where people with physical impairments are encouraged and guided towards a new beginning, stimulated by what they can – rather than cannot – do, advancing their activities and raising self-confidence to achieve greater levels of independence in everyday life.